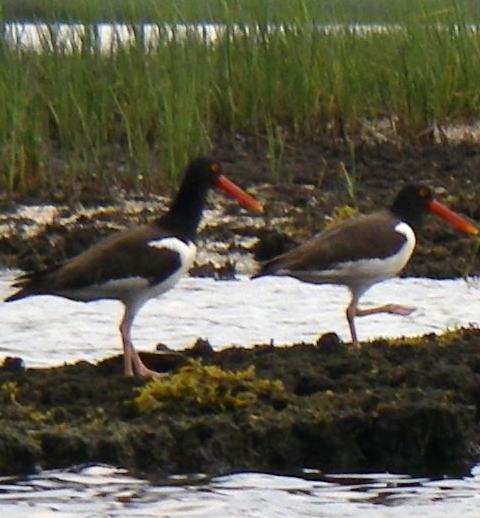 American oystercatchers (Haematopus palliatus) with bright orange beaks and penetrating golden eyes offer an exquisite contrast to the browns and grays and greens of the coastal New England landscape. Nearly driven to extinction in the Northeast due to poaching and hunting, the species began to return to Massachusetts waters under the protection of the Migratory Bird Treaty, but populations remain uncomfortably low. 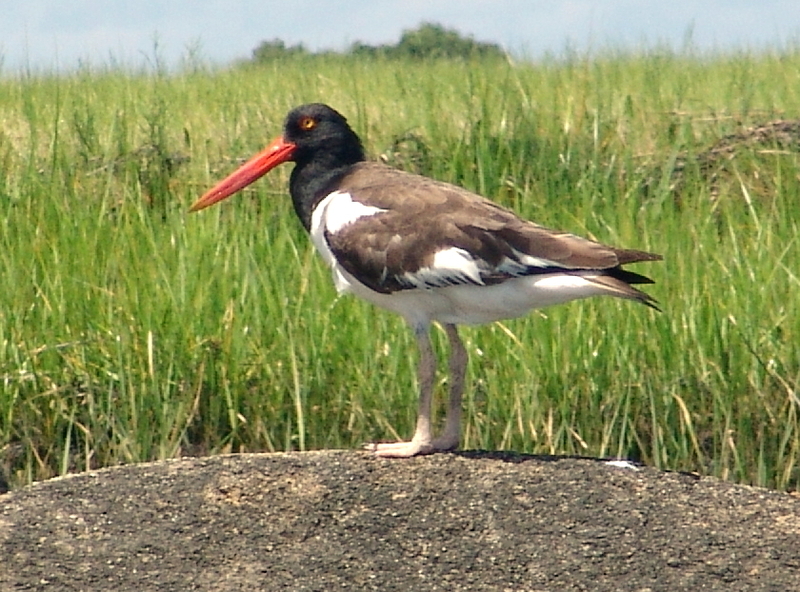 Not covered by the federal Endangered Species Act, American oystercatchers depend on the protection of individual states, many of which list them as a species of special concern because of dwindling populations. 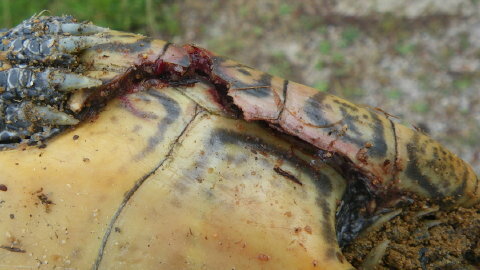 Unfortunately, Massachusetts is not one of these states. 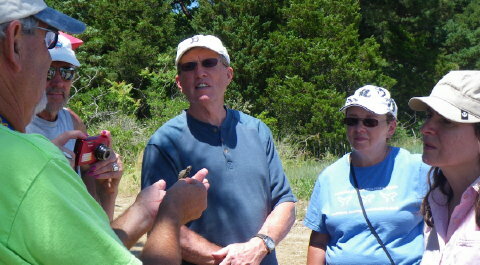 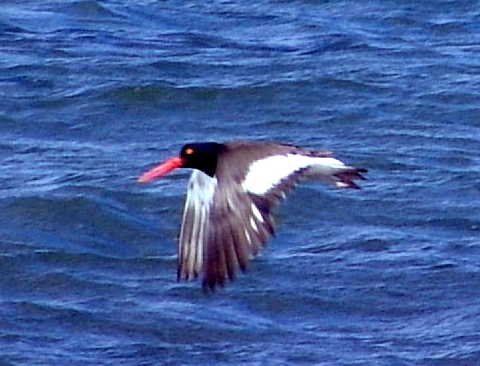 Massachusetts Audubon Society, through its Coastal Waterbird Program, monitors American oystercatchers, and Mass Audubon’s Wellfleet Bay Wildlife Sanctuary director Bob Prescott (rprescott@massaudubon.org) has taken a special interest in protecting these beautiful coastal birds. 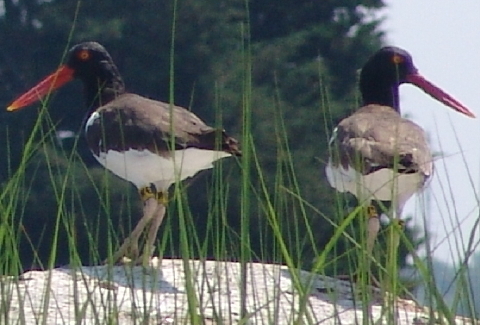 When nesting pairs are identified and located, Mass Audubon has installed symbolic fencing to protect the pair from unintended disturbance. Turtle Journal has observed breeding pairs on the Outer Cape and on the SouthCoast and notes that parents are extremely dedicated to and protective of their nests and their young. 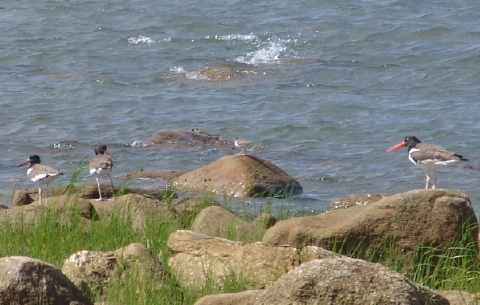 Turtle Journal has documented American oystercatchers on the SouthCoast for the last seven years coincident with our diamondback terrapin studies from Mount Hope Bay on the Rhode Island/Massachusetts border to the Cape Cod Canal. 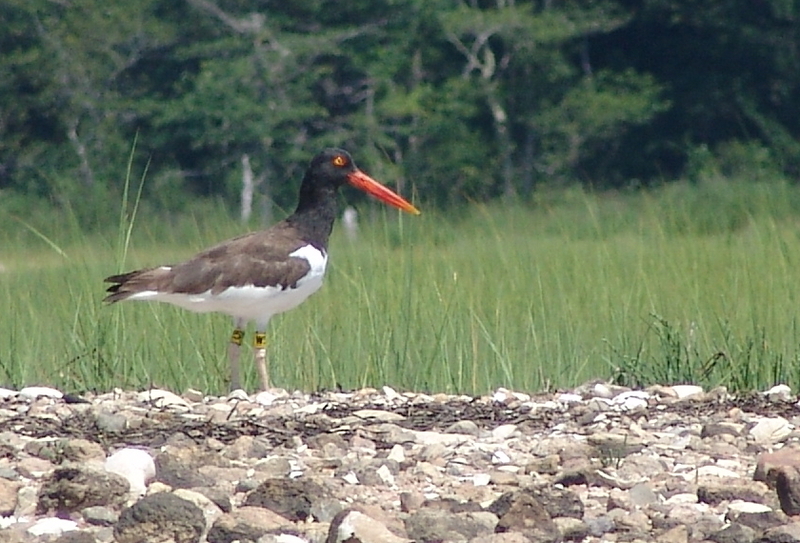 This summer, Sue Wieber Nourse discovered a breeding pair, including banded oystercatcher “W5″ above, on rocky, salt marsh Gravel Island in Marion’s Sippican Harbor. 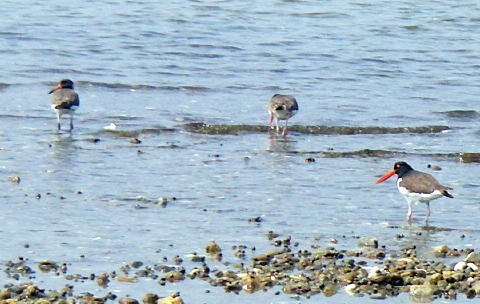 A couple of weeks later, Sue found oystercatcher “W5″ and three others foraging the tidal flats 1.75 miles to the south on Stewarts Island in Sippican Harbor. 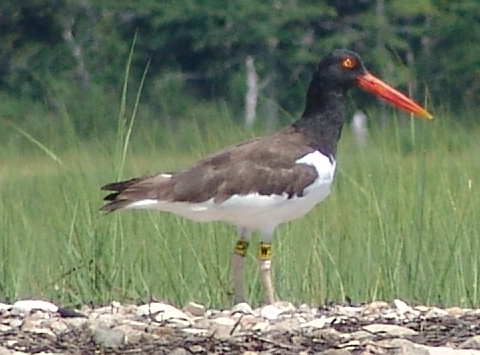 In August 2007, Turtle Journal’s Don Lewis (Don_Lewis@post.harvard.edu) documented two juvenile American oystercatchers with parents on the north shore of West Island in Fairhaven. 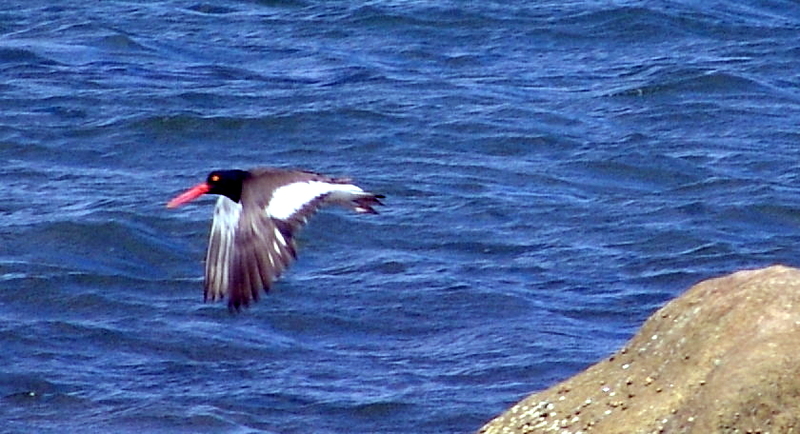 Turtle Journal found another breeding pair of American oystercatchers on Aucoot Cove’s barrier strip in July 2007. 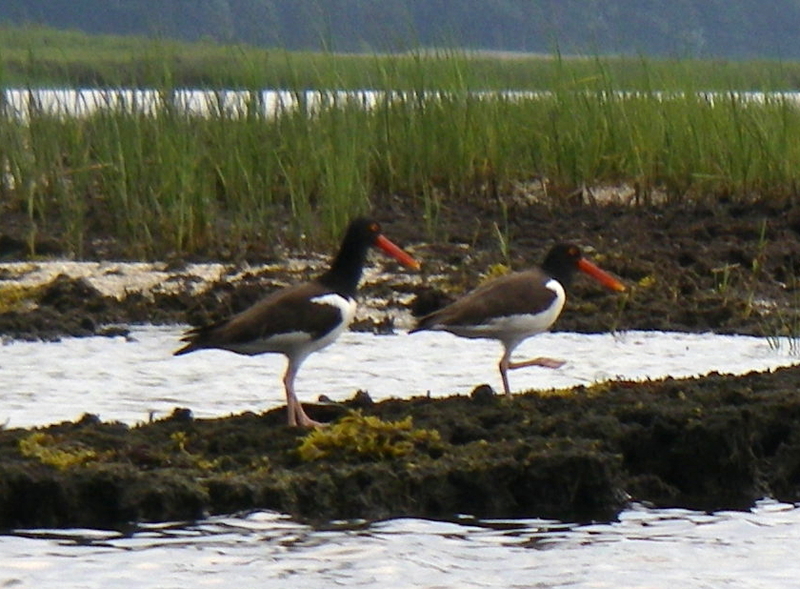 Then, later in the summer, Turtle Journal discovered the oystercatcher parents foraging along the shoreline of Aucoot Cove with a juvenile. 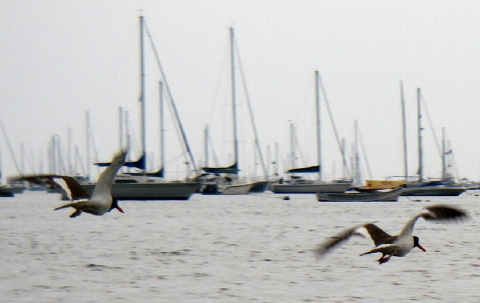 Sippican Harbor in Marion is an active sailing center with hundreds of yachts moored at anchor between Head of Harbor to the north and Ram Island in the south. 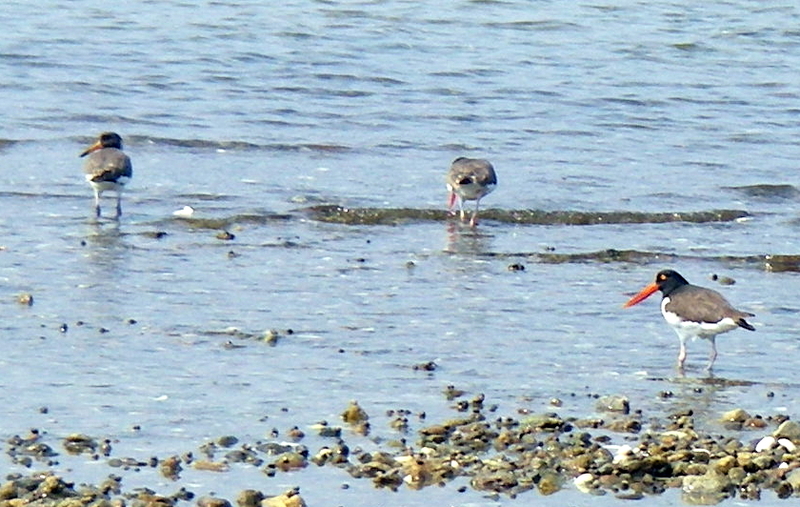 Luckily, there are a number of small, gravelly marsh islands scattered through the estuary where pairs of osytercatchers can secret themselves away from the noise and the flutter of summer busy-ness. And while the SouthCoast can’t rival the Outer Cape for isolation, there remain a few spots like the north shoreline of West Island in Fairhaven where humans have trouble frequenting. 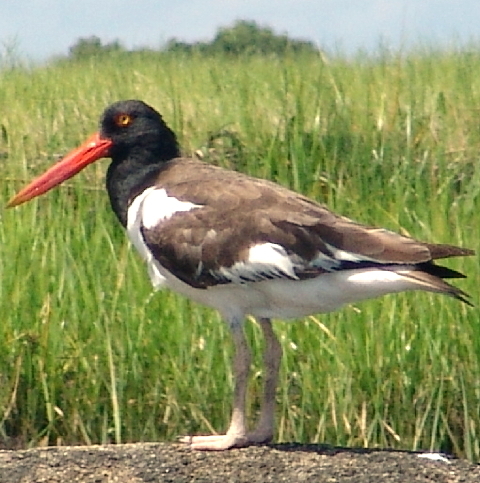 If you’d like to help restore American oystercatcher populations in coastal Massachusetts, let Turtle Journal know if you discover a breeding pair or have a sighting of these magnificent shorebirds. Our 24/7 hotline remains open at 508-274-5108. 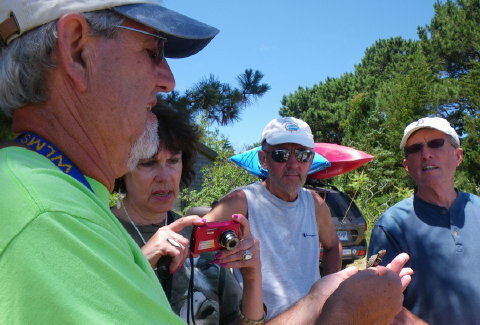 Of course, Massachusetts Audubon’s Wellfleet Bay Wildlife Sanctuary welcomes information on potential nesting sites and can be reached at 508-349-2615. 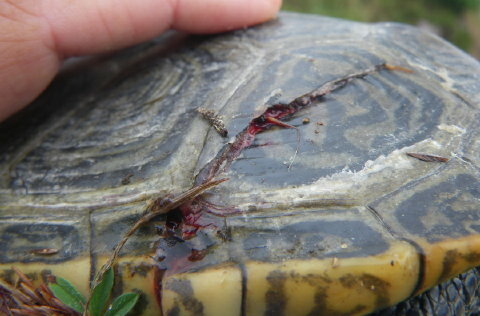 On July 18th, 2009 young female terrapin #2728 nearly lost her life. She came ashore on Lieutenant Island in Wellfleet Bay to return to her natal site to deposit the next generation of threatened diamondback terrapins. 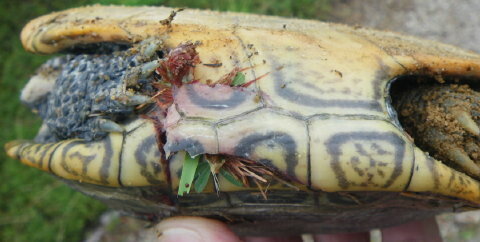 Instead, she was run over, her shell was broken and crushed. Rather than giving up the quest, she crawled bleeding and dehydrated to the end of Marsh Road and spent the night digging through a compacted gravel driveway to lay her eggs. Her epic struggle became a page one story on several Cape Cod newspapers and was documented on Turtle Journal under the posting: Turtle Bests Odds to Win Epic Struggle to Save Offspring. After assessing her injuries and cleansing her wounds, Turtle Journal’s Don Lewis decided that her best chance of survival was an immediate return to the healthy terrapin habitat surrounding Lieutenant Island. 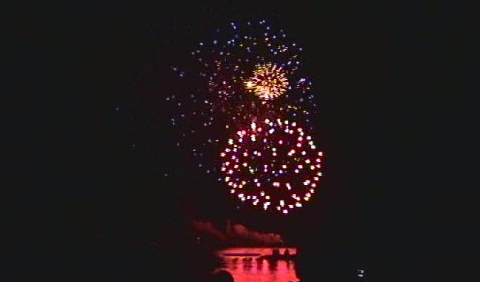 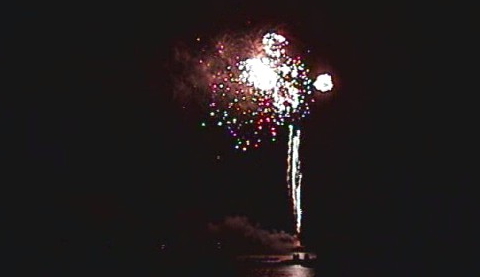 (You can see her release in a video clip in the July 2009 posting or click here.) 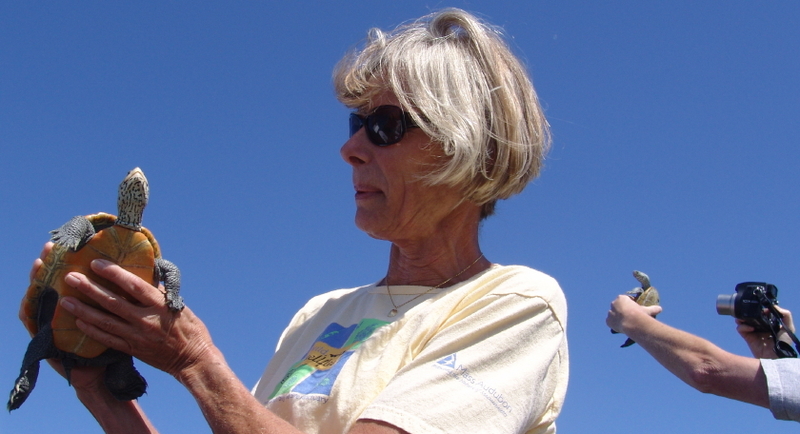 That decision was not universally applauded by others who thought she should have been admitted for long-term medical care and rehabilitation, instead. 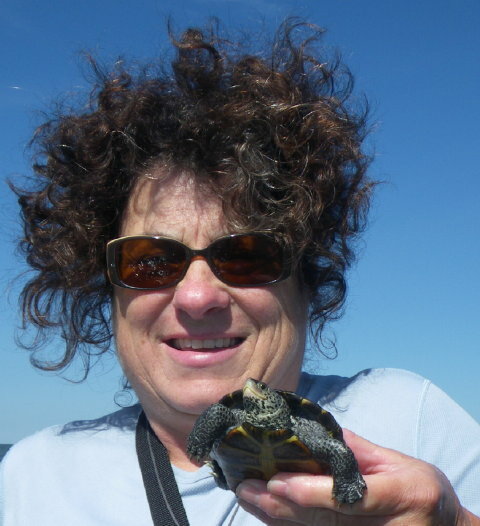 Fortunately, this afternoon Sue Wieber Nourse of Turtle Journal recaptured Terrapin #2728 in Loagy Bay on the east side of Lieutenant Island. 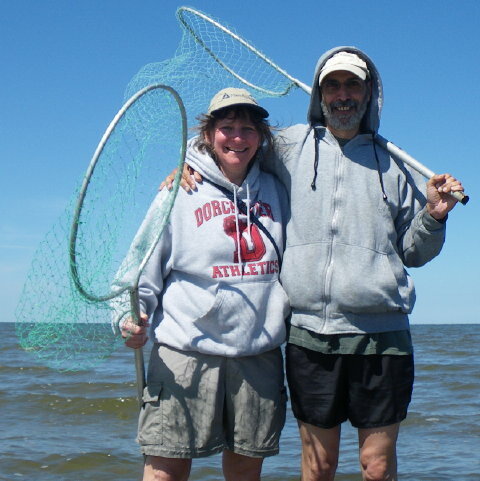 Her healing and recovery over the last 12 months has been nothing short of miraculous. 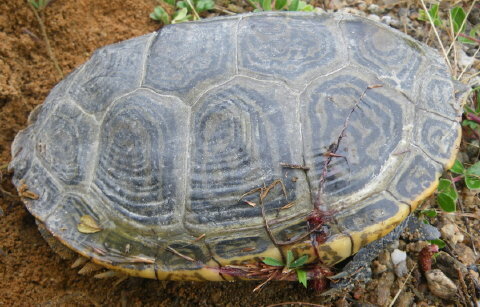 Her length increased by only 1.5 millimeters … a mere 1% growth, BUT her weight jumped from 724 grams after her accident and depositing eggs in July 2009 to 925 grams today (nearly 30% improvement). 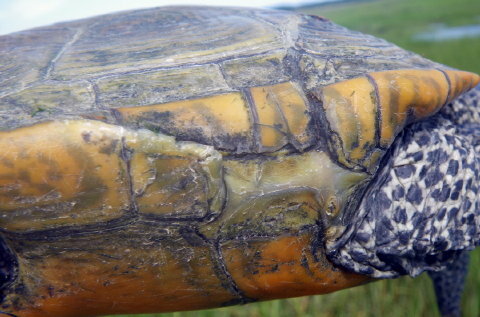 Her behavior was normal and healthy; her broken shell had sealed and healed. In the series of before and after images that follow, you can examine the extent of her recovery in almost exactly one year, nearly 7 months of which was spent in deep brumation under the oozy bottom of Wellfleet Harbor. The final activity for the 2010 Turtles of Cape Cod Field School focused on nesting patrols of Lieutenant Island and Indian Neck in South Wellfleet. 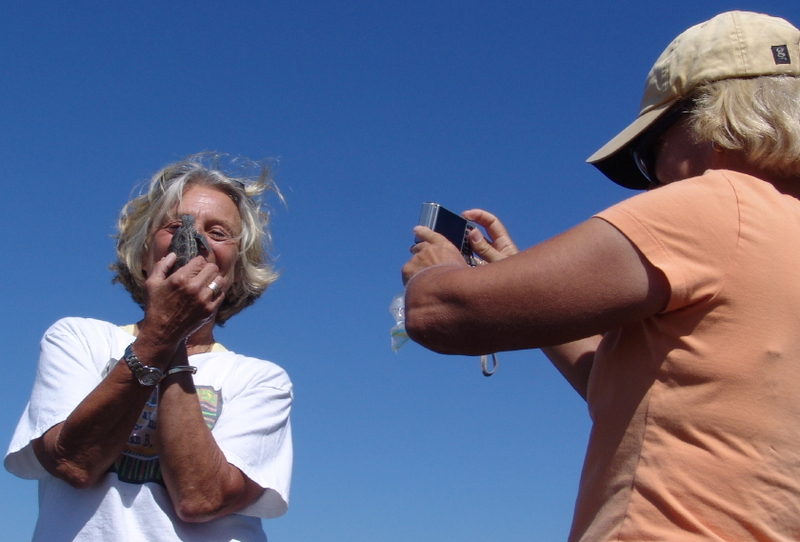 Eager participants, despite three days of intense physical activity interspersed with lectures from first light to late in the evening each day, patrolled nesting sites in search of terrapin tracks, female terrapins and nests to protect from predators. 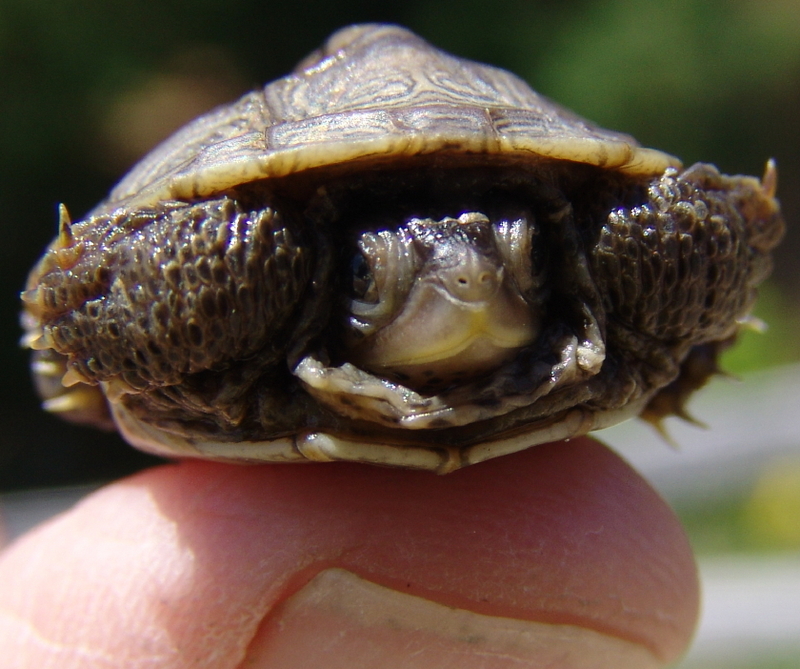 What they found on this final activity of the field school was a real gem: a quarter ounce, one inch long terrapin hatchling that barely covered my fingertip. 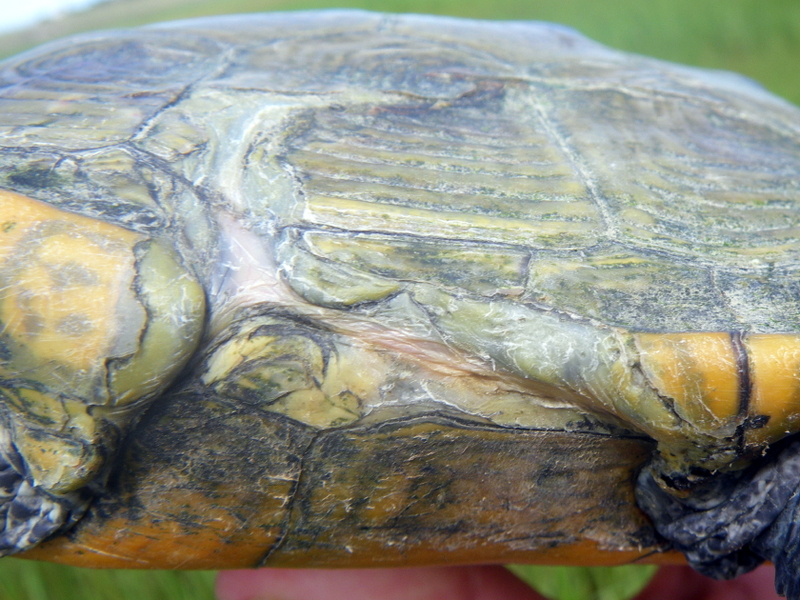 This hatchling had been born last fall and immediately burrowed into the uplands to snooze through the long, harsh Cape Cod winter and live on the generous yolk sac that mom had given her. 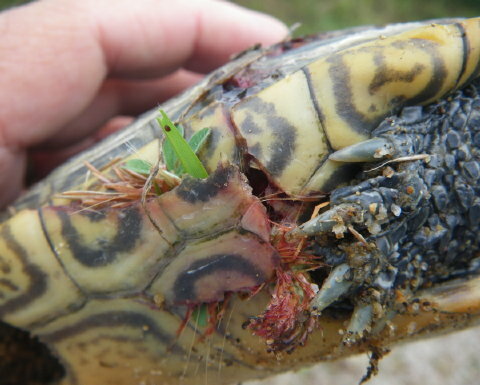 Once late spring and early summer temperatures had heated her winter hibernaculum, she tunneled to the sunlight and began wandering in the random way that terrapins do in search of nursery habitat in the thick salt marsh grasses. 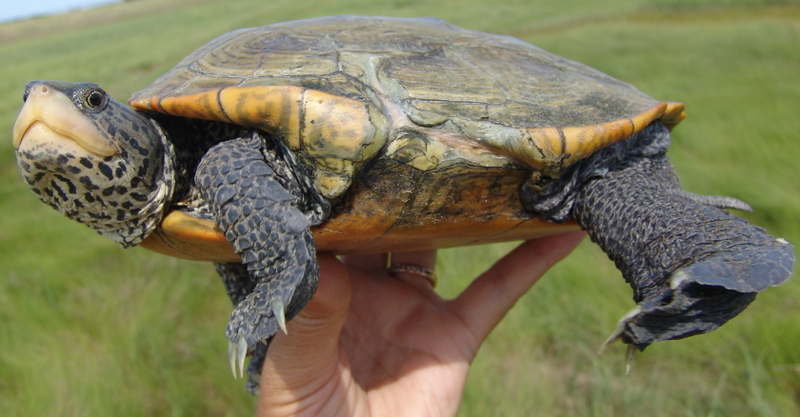 Unfortunately, not every hatchling actually finds refuge in nursery habitat. 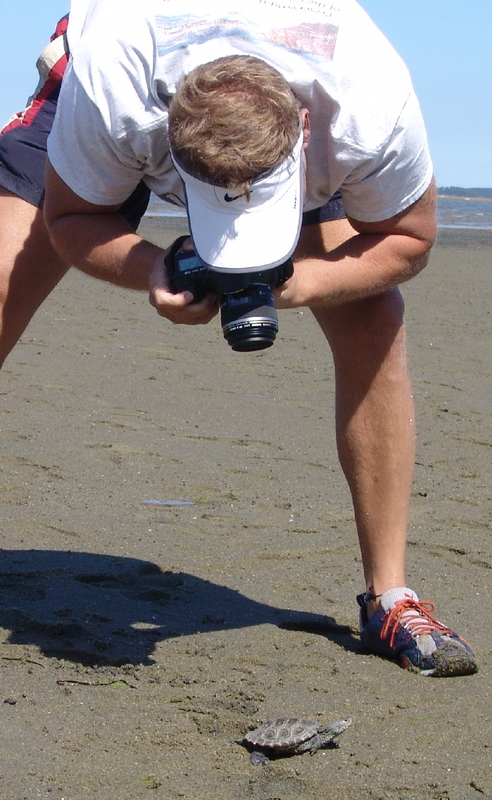 This little critter had been crawling around parched sandy dunes for perhaps a month or more. She was dehydrated and had used up her nutrient stores. Worse still, she had stumbled into the edge of unprotected Cape Cod Bay where she would have quickly been gobbled up by any one of myriad predators. 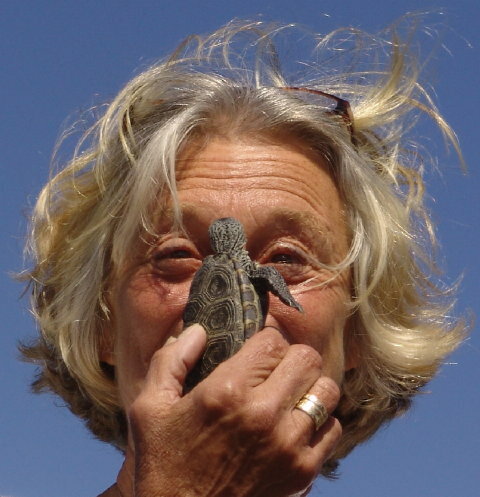 Luckily for this precious bundle, she was discovered just as she hit the waves and was rescued. 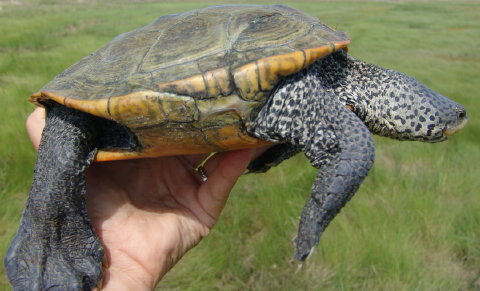 The rescued hatchling spent a couple of days rehydrating in warm fresh water and has been released back near her natal nesting site in the thick nursery salt marsh grasses of Herring River at the northernmost habitat for diamondback terrapins in the world. What better ending could there be for the Turtles of Cape Cod Field School than rescuing one of these threatened turtles from sure death? 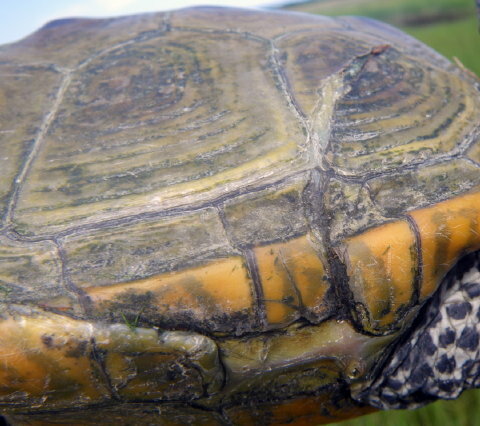 For leaders and participants alike, this tiny critter placed an exclamation point on a highly successful field school adventure that had produced great scientific data for both diamondback terrapins and Eastern box turtles, arguably the most successful field school in our ten year history. 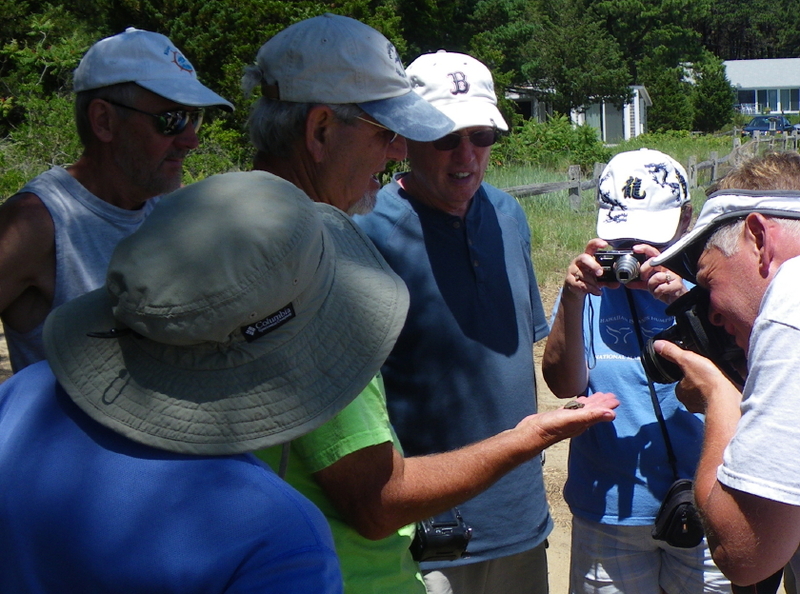 The third morning of field school begins with a search for diamondback terrapins in the Run … the estuary between Lieutenant Island to the north and the Mass Audubon Wellfleet Bay Wildlife Sanctuary to the south. 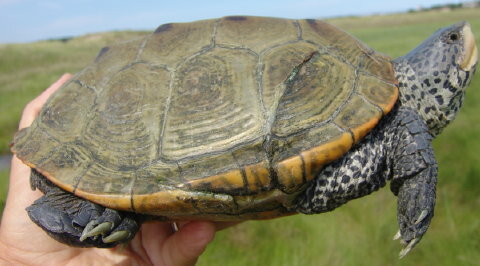 When low tide drains the estuary, terrapins are forced to flow with the tide into Wellfleet Bay. 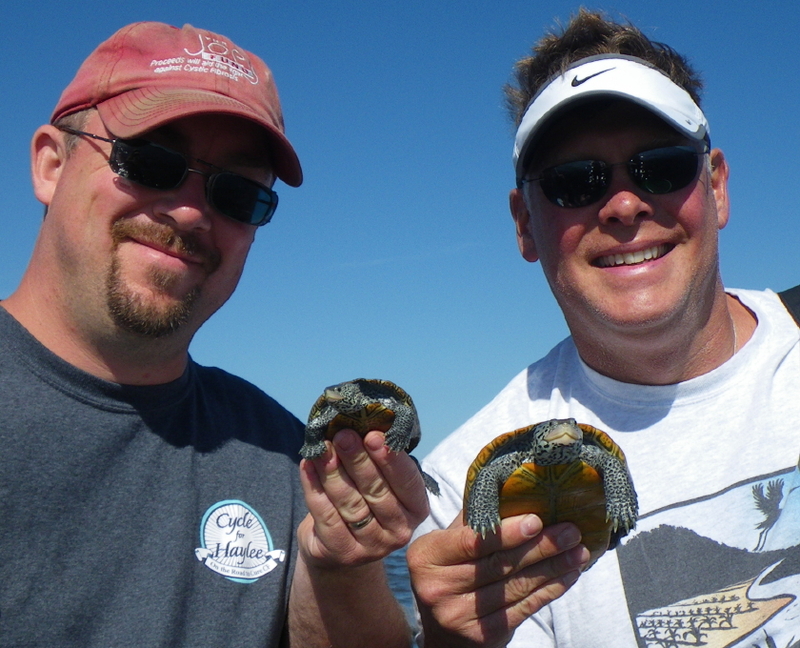 As the tide turns, turtles begin to head back into the shallow estuary, affording an opportunity for researchers to net them in relatively clear water. 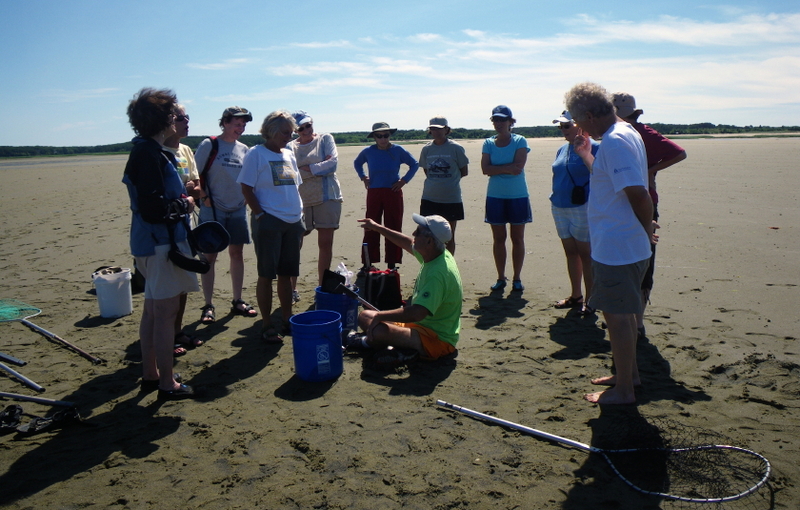 Participants gathered on the low tide drained tidal flats for last minute instructions. 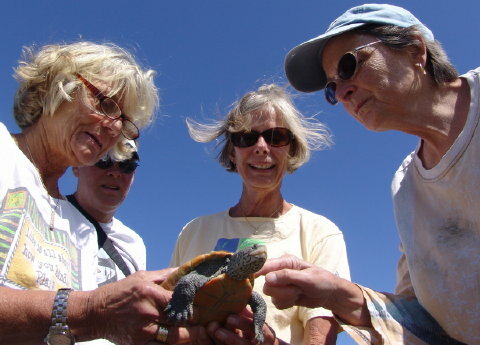 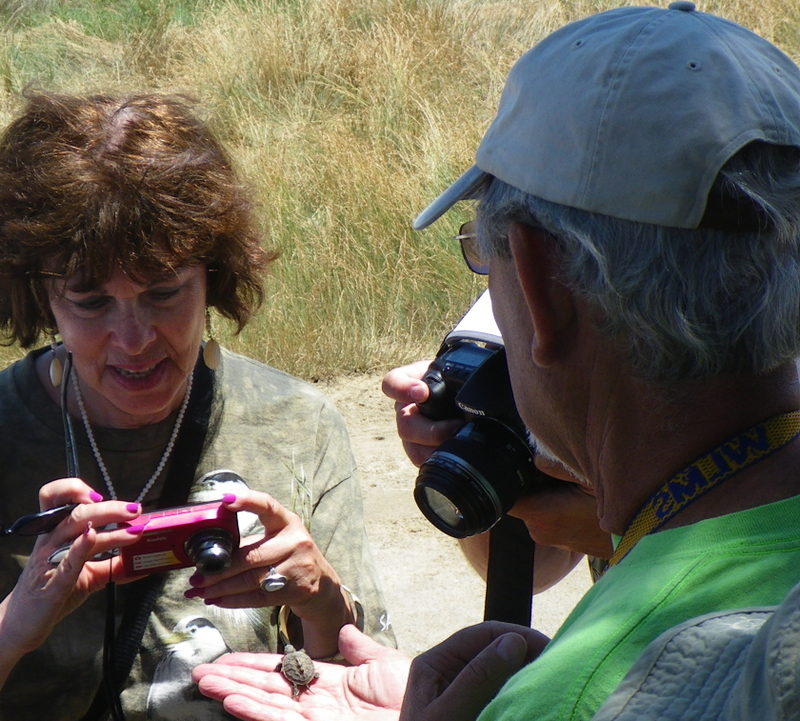 Sue Wieber Nourse led the water search for turtles while Don Lewis and Barbara Brennessel set up a processing and documenting station on the flats. 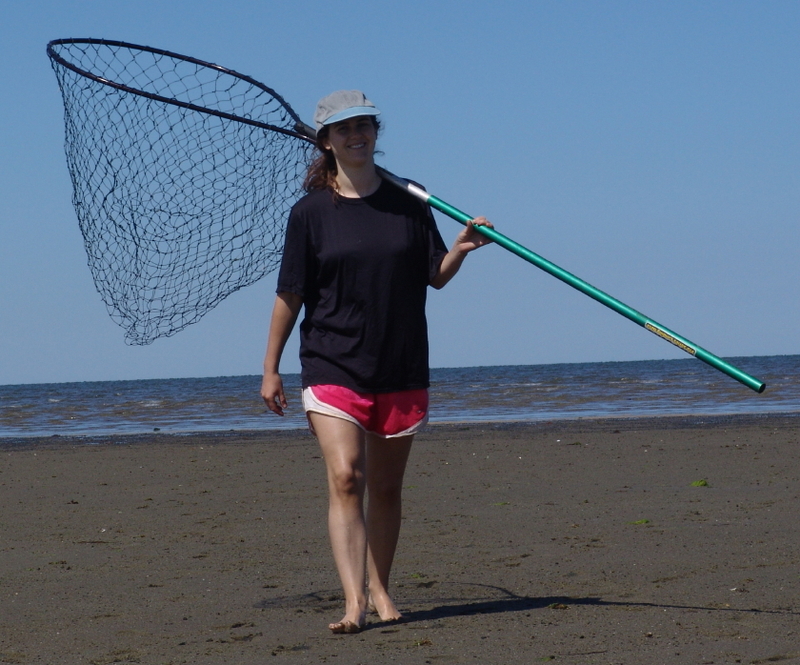 Nets at the Ready, The Game’s A-Foot! 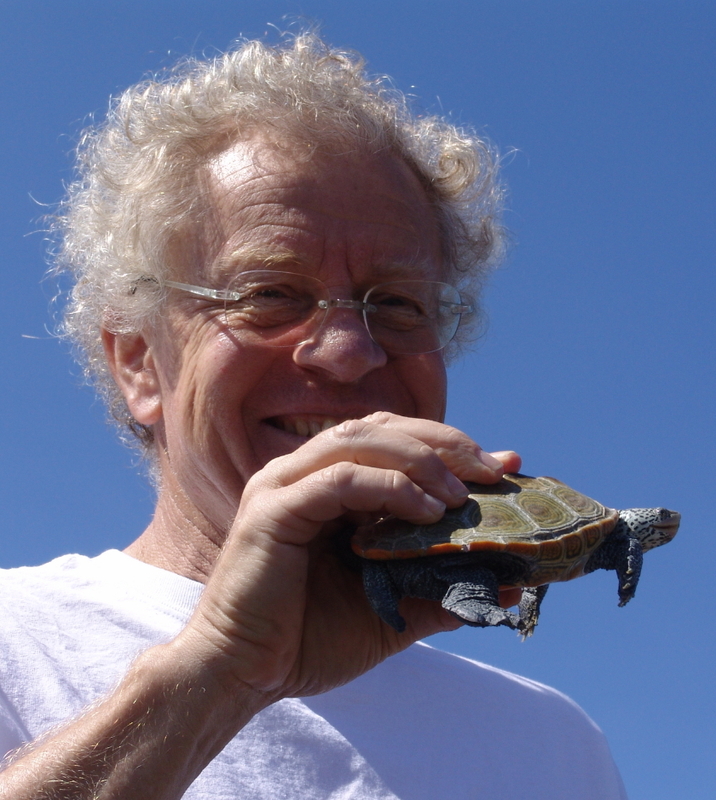 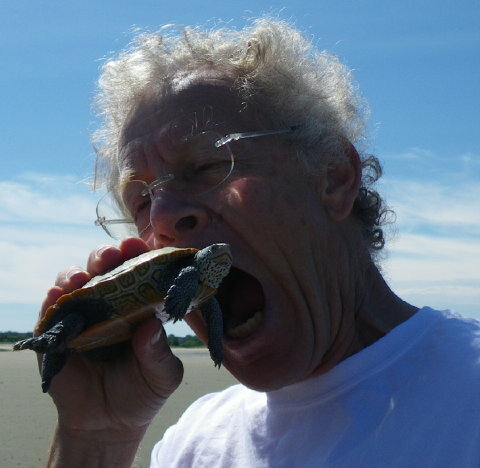 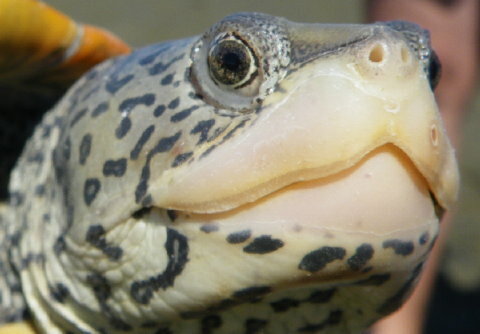 You are currently browsing the Turtle Journal blog archives for July, 2010.